“Chemical engineering” is the branch of engineering stream deals with the design, control, construction, supervision, installing and operating of equipments and the plants for manufacturing the chemical products. It is also involved in the development of new methods for production. Chemical engineering is a branch of engineering helps in providing man-made and synthetic material in replacement of limited natural material and resources. 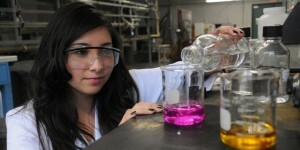 Chemical engineering overlaps the other technical fields like, nanotechnology, fuel cells, and biomedical engineering. “Chemical Engineering is the science that deals with the principles which involves understanding and describing the chemistry, chemical properties, analysis, environment and their control”. Chemical engineering contains manufacturing paints, plastics, fuels, medicines, fibers, fertilizers, papers, semiconductors and others. A chemical engineer carries out the chemical experiments, resulting purification and cleaning technology for protecting the environment. Get Latest Career Notification about Chemical Engineering Courses, by entering your details below. In India, there are several chemical industries and several are moving to our country from abroad. It is a sign of better opportunities for the chemical engineers. Chemical engineering is the broadest field of research and development and this thing offers the various courses in this field. The required minimum qualification for these courses is 10+2 with science. The diploma courses are leading to the polytechnic diploma. The duration of the diploma courses is 3 years after the completion of 12th standard. The undergraduate degree programmes are leading to the B.Tech (Bachelor of Technology) degree courses and the B.Sc (Bachelor of Science) degree courses. The duration of the UG degree courses is 3 – 4 years after the completion of 12th standard. The postgraduate degree programmes are leading to the M.Tech (Master of Technology) degree courses and the M.Sc (Master of Science) degree courses. The duration of the PG degree courses is 2 years after the completion of undergraduate degree programmes. Some of the universities offer integrated degree programmes leading to the M.Tech (Master of Technology) degree courses. The duration of the integrated degree courses is 5 years after completion of 12th standard. For admission in polytechnic diploma programmes and the UG degree leading to the B.Tech degree courses, the candidate must have passed the plus two examinations/12th class/10+2 with the minimum of 50% with science subjects out of chemistry, mathematics and physics. For admission in diploma courses leading to the polytechnic diploma, the candidates must have to appear in JEEP 2019 entrance examination, and for admission to UG programme, the candidates must have to appear in JEE (Main) entrance examination. Some of the universities conduct their own entrance examinations. The admission is based on the minimum 50% marks in the qualifying examination and the score in the entrance examination, followed by the counseling and personal interview. For admission to PG programmes, the students need to attain the GATE entrance examination after the completion of UG degree in the same or equivalent field. A chemical engineer is the man who uses the natural material or the waste material and turns that into the useful or less harmful for our use. The chemical engineer can work and help with the products like cosmetics, medicine, papers, food & drink, textile, fuel, oil & gas and metallurgy for furniture and vehicle. The chemical engineers are commonly called as the “Universal Engineers” for their deep knowledge in both; engineering and chemistry. It proves that the professional can find the job in various fields. There is an opportunity to work with the any organization wherein the chemical research work has been done. In the field of chemical engineering, a fresh graduate may get the initial salary around Rs. 20,000 to Rs. 25,000 per month in India or $35000 to $40000 per annum in the US or abroad. An experienced professional may get the higher post and remuneration around Rs. 40,000 to Rs. 50,000 per month in India or the $90000 to $100000 per annum in the US or abroad. For any other queries about Chemical Engineering, you may leave your queries below.